This is a property for those that love to swim!! It is a rather strange home in that the 4 bedroom house itself is held on 1 title deed and the enormous swimming pool is shared with 1 neighbor on a separate deed. The home is for sale with 50% share of the pool included in the price. The neighbor only vacations in Thailand for a month or 2 every year so effectively it is like a private pool and garden!! If that does not suit a wall could be built to seperate garden and pool from the neighbor so you would have a pool with 100% privacy. The house has 4 bedrooms, 3 bathrooms, large living area, European kitchen, garden terrace and covered parking. The village only has 16 houses and does offer security. The home itself is only minutes from South Pattaya and Jomtien Beach. Soi Khaotalo has a large infrastructure of shops, restaurants, banks etc within walking distance of the home. It is also located close to a Thai school and about 1km from an International school. The house is held in a company name and this will be sold with the home so no large taxes and transfer costs to pay. 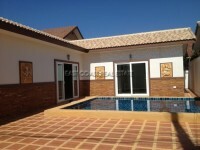 The home can be sold seperately from the pool if required for a fixed fee of 3,750,000 Baht.